These are the deep questions posed by the cardboard case of Dungeon Master, and one must admit, they took a lot more effort to draw the player in than the cases of today, “play this, has multi-player”. As did the instruction manual. In fact, if you got a copy of this game and did not get the instruction manual, particularly in a pre-google era, you were totally screwed. The premise of the story is explained in a 16 page prologue that can be found at the front of the manual. In it we find that you will play the character of Theron, the servant of the great (and totally ambiguous) Greylord. He found an all powerful gem, known as, unsurprisingly enough, the power gem, under his mountain labyrinth, which he needs… for reasons. He tries to take it out of the mountain and basically the world blows up. You are forced into a magical slumber and are awoken as a ghost. You meet the Greylord, but now he is the model of order and justice, basically Gandalf the white. He tells you he was split into two parts and his evil chaotic side is now ruling the world from inside the labyrinth. He needs you to go get the Firestaff from inside the dungeon to restore order, or something. You are then told about champions who tried before you and how they have been imprisoned in mirrors and can be resurrected to help you do this. The manual then gives you eight pages of story about a group of four champions, their exploration and demise inside the dungeon. The true little devious thing about the manual however is, it contains an explanation of weird hieroglyphics that are needed to use spells in the game. You have to input them in the correct order, you could need to put in a combination of six characters from a pallet of thirty in order to do something as simple as light the darkness. If you don’t have the manual, today you can do an image search, and eventually may find one, when the game came out you hadn’t a hope. This made me so glad I didn’t rent the game. This game may be the reason I like survival horror, and Souls’ games. You are put into a first person view of a dark narrow corridor of ancient stone and mildew. Sound plays a big part, as you cant see much ahead in the darkness. A drip of water nearby lets you know there may be a fountain nearby, and you will really want it as your characters can die of hunger and thirst, while the ominous thuds of croaking in the distance can alert you to monsters in the darkness. After you experience your first monster, you really don’t want your torch to go out, or a hidden wall to open up revealing something grotesque. This is because, the monsters will stare at you, stand in front of you, then, when your not expecting it, they will look at you and scream randomly, in what I can only think of as early introductions of jump scares in gaming. You really have to listen to the sounds in the dungeon, as the game progresses in real time, there is always a chance of something finding you, or triggering a very well hidden trap or pitfall. Your character also have to sleep to regain stamina but you have to be extremely careful because monsters can attack you when you are looking at the sleeping screen, you can also starve in your sleep. The worst thing you can come up against is the creatures described as non-corporeal beings, if you have no magic symbols prepared, they can literally scream you to death, and even in pixelated graphics, they are pretty unsettling. Weapons and classes are given very little explanation and your really have to figure out what works for you by yourself. You have fighters, healers, magicians and ninjas. Every character can gain experience in every class by repeatedly using a skill. This is where the old SNES turbo controls came in handy. You could set a character with a dagger to stab thin air all day while you went for a cup of tea, and come back to find he was nearly a master level ninja (although an almost starved ninja at that). The game manual also suggested that you were an explorer and were expected to make a map of the dungeon. Players were advised to use a maths copy and each square represented a step in the corridor of the dungeon. Get your pencils ready if you want to play the game as it was intended. There was very little music in the game. But when there was, it was either very cheesy, or a major warning that you were not in a good place to be. The deeper you got into that dark hell hole, the more attached you became to keeping your characters alive. Particularly because if one died, it was almost impossible to finish the game. You would have to carry his bones through the darkness and monster infested maze to an ‘alcove of rebirth’. His bones would weigh a tonne, and this game was one of the first ones I encountered with weight limit to what you can carry and equip. 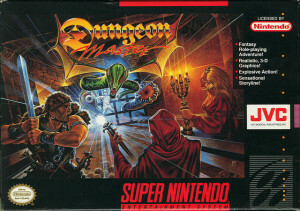 You think Skyrim and Dark Souls are bad for being overloaded by possessions, you haven’t experienced Dungeon Master. You really have to be frugal with what you bring with you, considering you need to have food in your inventory or starve and die. Despite its nerdy premise, this game is really fun to play. I have replayed it many times, and even today I still get a little spooked by the creaking in the darkness. This game required a lot of time, patience and though, however, and if it was to stand the test of time, most likely it has failed. I would say however, if you do have the time for something different, and can see beyond this games graphical limitations, give it a try. Until recently, there hasn’t been a game quite like it, but Legend of Grimrock, available on Steam, pays tribute to this game in a big way.